Upright: Intuition, sacred knowledge, divine feminine, the subconscious mind. The High Priestess sits in front of a thin veil decorated with pomegranates. The veil represents the separate conscious and subconscious realms, the seen and the unseen, and serves to keep casual onlookers out. Only the initiated may enter. The pomegranates on the veil are a symbol of abundance, fertility and the divine feminine, and are sacred to Persephone who ate a pomegranate seed in the underworld and was forced to return every year. On either side of the High Priestess stand two pillars, marking the entrance to this sacred, mystical temple (also associated with the Temple of Solomon). One pillar is black with the letter B (Boaz, meaning ‘in his strength’) and the other is white with the letter J (Jachin, meaning ‘he will establish’). The black and white colours of the pillars symbolise duality – masculine and feminine, darkness and light – stating that knowledge and acceptance of duality are required to enter this sacred space. The High Priestess wears a blue robe with a cross on her chest and a horned diadem (or crown), both a symbol of her divine knowledge and her status as a divine ruler. In her lap, she holds a scroll with the letter TORA, signifying the Greater Law (according to A. E. Waite). It is partly covered, signifying that this sacred knowledge is both explicit and implicit, it will only be revealed when the student is ready to look beyond the material realm. 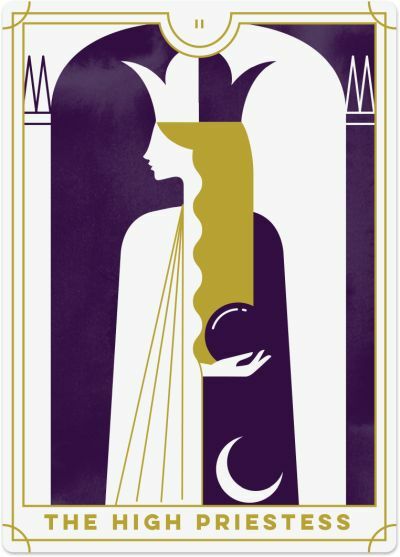 The crescent moon at her feet symbolises her connection with the divine feminine, her intuition and subconscious mind, and the natural cycles of the moon. While the Magician is the guardian of the conscious mind and the tangible world, the High Priestess is the guardian of the subconscious mind and the teacher of sacred knowledge and hidden mysteries. Sitting at the threshold of the conscious and subconscious mind, the High Priestess has an innate ability to travel between these realms effortlessly. She teaches you that the world is not always as it seems and more profound influences are often at play. She ushers you through the thin veil of awareness, offering you a deep, intuitive understanding of the Universe and a heightened awareness of secret or hidden information. The High Priestess signifies spiritual enlightenment, inner illumination, divine knowledge and wisdom. She shows up in your Tarot readings when the veil between you and the underworld is thin, and you have the opportunity to access the knowledge deep within your soul. Now is the time to be still so you can tune in to your intuition. The answers you are seeking will come from within, from your deepest truth and ‘knowing’. Allow the High Priestess to become your guide as you venture deep into your subconscious mind and access this inner wisdom. Connect with your intuition and your Higher Self through meditation, visualisation, shamanic journeying, and being part of spiritual communities. Your intuitive sense right now is providing you with useful information and is assisting you to become more in touch with your subconscious mind. Knowledge of how to fix these issues will not come through thinking and rationalising, but by tapping into and trusting your intuition, so allow yourself the time and space to meditate and attend to your inner voice. Look for areas in your life that may be out of balance or lacking ‘flow’ and ease. Now is also a time of heightened intuitive ability and psychic insight. If you are developing these skills, the High Priestess offers you further encouragement to continue your journey and trust that you are on the right path. The more you listen to your intuition, the more it will flow. Finally, the High Priestess is a signal that you are being called to embrace the Divine Feminine – your connection to your intuition, compassion, empathy, and inner wisdom. Regardless of your gender, it is vital for you to balance and integrate your masculine and feminine energies, and the presence of the High Priestess signals that your sacred feminine needs your attention right now. Feel, rather than think. Collaborate, rather than compete. Create, rather than destroy. Trust your Divine Feminine energy, even if the masculine energy around you may appear to be stronger. Be proud of your ability to nurture, trust, sense, and empathise instead of hiding it away. The reversed High Priestess calls on you to be still and direct your attention inward to listen to your voice and wisdom. You may be swayed by other people’s opinions or swept up in their drama when what you really need to do is focus on what is right for you. It is time to get quiet and withdraw yourself from the external world to observe what your inner guidance is sharing with you now. 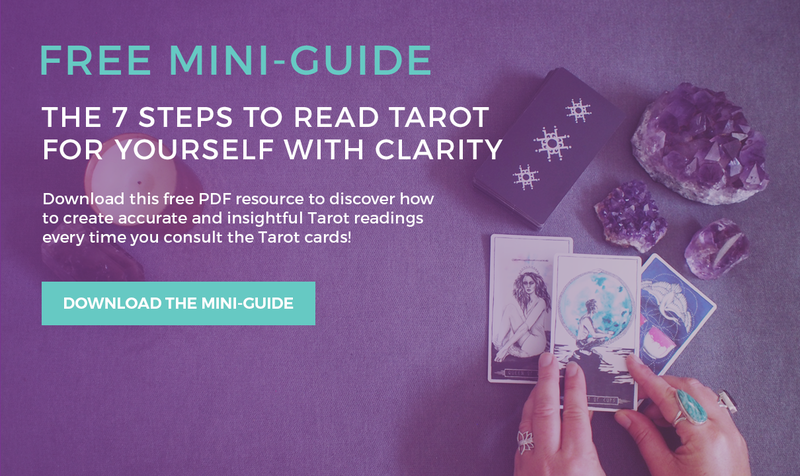 Ask yourself: Do I struggle to trust my intuition fully? Perhaps you doubt yourself or feel silly or guilty for listening to your intuition, and as a result, you deny your ability to tune in and receive this potent information. You may also keep your intuitive capabilities hidden from others, fearful of their judgements or opinions. If this resonates, know that your intuition is your superpower, here to guide you and help you. Have faith in the Universe and allow yourself to be in flow with its energies. Surrender and let go. Think of the High Priestess as the calm centre inside of you that is untouched by your external world and trust that she is always there when you need her. Whenever you worry that things are just getting too crazy, find a quiet space and meditate so you can hear her voice. If you stop thinking or fretting about your issue and instead clear the way for your intuition to speak to you, the answer will follow. Finally, the secretive nature of the High Priestess may suggest gossip and hidden agendas. Others may be keeping information from you or talking about you behind your back and sharing mistruths. Rather than making assumptions or diving into the depths of paranoia, have an open and honest conversation to surface and address these secrets.